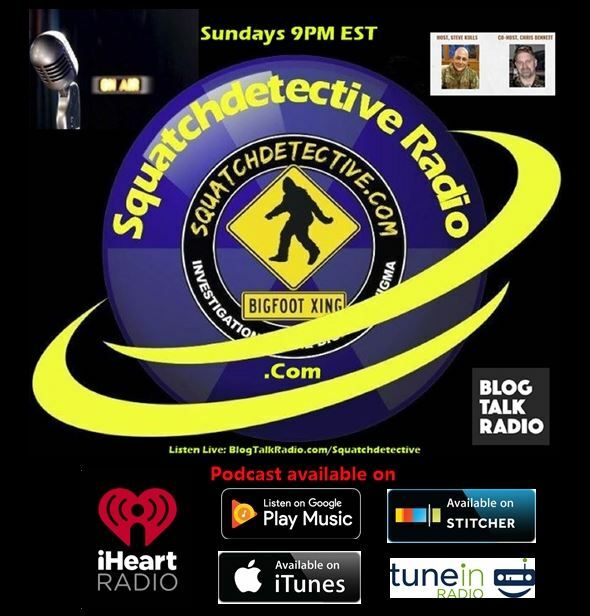 From time to time in the Bigfoot research arena, we for years are continued to be deluged with video we have seen time and time again. Often having us dust off old files to again retell the debunking or the truth in the subject matter. Some of the “Noobs” often would like to argue with the facts long established, sometimes decades old. Instead of taking the long procedural approach many researchers took the “Pre-Social” media age somehow some of these new folks want to reinvent the wheel. Okay fine, but often we see leaps of faith because the evidence used in the original investigations has since long been removed or deleted from existence. I have seen that in the Bannon Bigfoot photo hoax several times over. Mind you this video came out in the late 2000’s. However a relative new person in 2014 did a video analysis (long since removed). See again, a video, photo or audio is only as good as the story behind it. This is where a lot of the newer folks go wrong. 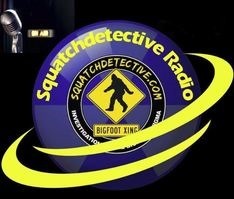 The same way years ago Facebook FindBigfoot went wrong. To take a piece of video, photo or audio on basis alone, without the well documented story behind it you have nothing. It defies the investigative process and it defies the scientific process. This had long been researched and was found to belong to an unestablished film maker, by the name of Shawn Bannon, who once owned a production company by the name of StudioDrome. 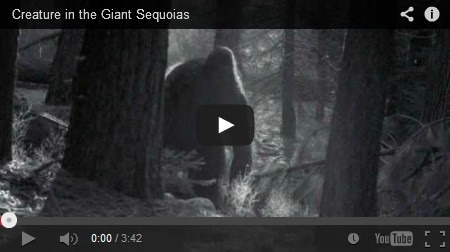 While on the face the videos and photos may look fascinating, the story of how he came about the video and photos were very scant aside from being out in the forest with friends. 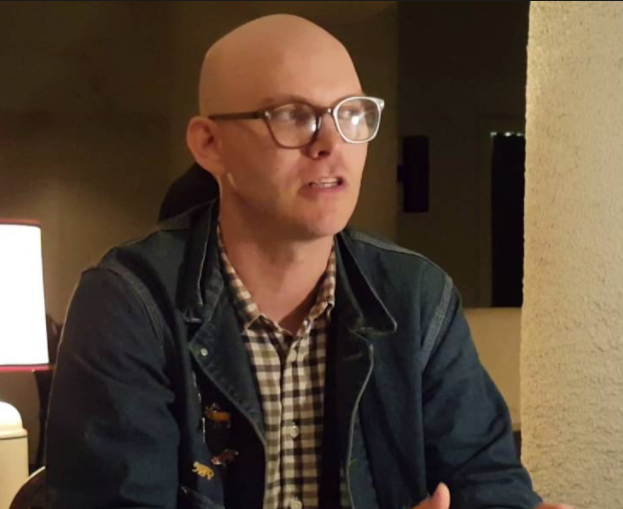 Although personally I did not investigate this, I publicly stated my opinion, and again I emphasize my opinion, that the evidence was a studio production because the pictures specifically looked airbrushed or altered in some manner and story and the willingness to communicate with researchers was a bit weak. (Much in the day before FotoForensics). And usually my gut is a good indicator and their are times you do have to fight that gut instinct, but not in this case. 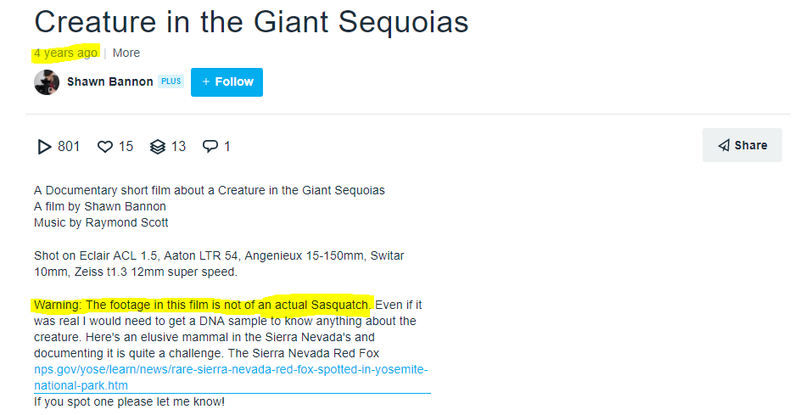 As it turns out after much debate and conjecture, and evidence against this being real, Bannon released some of the documentary on Vimeo in 2014, very clearly stating the Sasquatch in the video and photos were not real. Despite Bannon “coming clean” in 2014, it does not take away the fact for years he propagated the media as authentic. Editor’s note…. What the new folks have to do is use the old analyses as a starting point. Find flaws in it if there are any that stick, and go from there. Not just arbitrarily take the evidence and go at it like it has never been looked at before. Does that create a bias? Perhaps, but as mentioned above some of the evidence available then, may not be available now. Check it’s history and fact check yourself and source your material. And it is okay from time to time be wrong or take a misstep. Freely admit it, we are human after all. 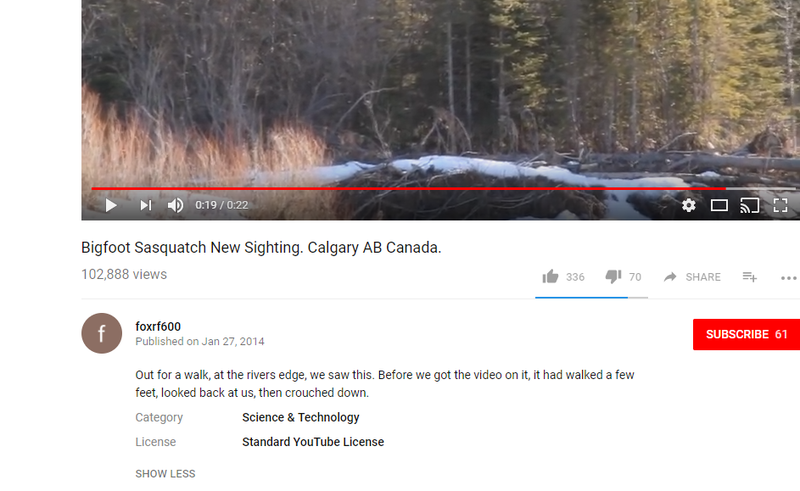 Now the matter at hand, as an Alberta, Canada video has resurfaced and now let the series of misinformation begin. THIS IS HOW IT ALL BEGINS!!! 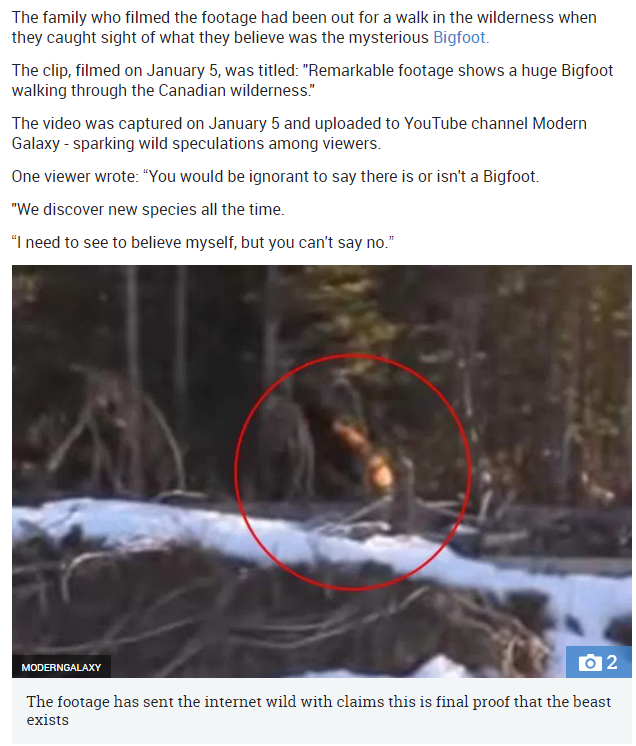 Here we have an article being propagated by a UK news source, and there are now a couple stating this video was recently filmed on January 5th, 2018. The fact is the video was uploaded originally to a YouTube user site by the name of “foxrf600” on January 27th, 2014. No surprise it was the last video uploaded to the account and only one other video had been uploaded to the account in 2010. Since the Homepage of the account has been edited to not include the “About” section, there is no way to send this user a message. No previous videos other than the one on the account to me makes it very suspect. May have been an old or forgotten account, hence the one earlier video. But none afterwards makes everything seem to me the person wanted to remain anonymous. Which leads to the next question, which I will answer. Doesn’t a witness deserve anonymity? Answer: Yes, absolutely, but if they wanted anonymity, why the hell post it on YouTube? Well its one of those inconclusive things. On merit the video looks like it may be possible, although there has been internet exchanges that the wording by the witnesses seems a little, “prepped.” Some claim though it seems authentic. Who knows at this point, because go back to my earlier statement: A video, photo or audio, without a story behind it, other than a cursorily posted description as the one above, is WORTHLESS. IT’S NOT EVIDENCE, IT’S NOTHING! Usually videos with such vague descriptions such as the one above generally tend to fetter out as nonsense anyway. Don’t know for sure in this case, but just stating the norm.